This seminar focuses on the role of various networks / networking tools & concepts in advancing collaboration and exchange between VJs in the Nordic / Baltic region. * Representatives of existing networks and active networking organizations will give presentations and feed the discussion. - Eye|con is an Austrian VJ label organizing large scale VJ events in Europe and acting as a bridge between promoters, equipment manufacturers and art organizations. Eye|con has for instance brought over 20 VJ collectives or artists from several European countries to Urban Artforms, the largest European Drum and Bass festival. They connect practicing VJs from different European countries (Austria, Spain, Germany, Finland, etc) to event organizers and work with various organizations across Europe. Eye|con will introduce the concept they have developed and bring knowledge of interesting models for organization and infrastructure. 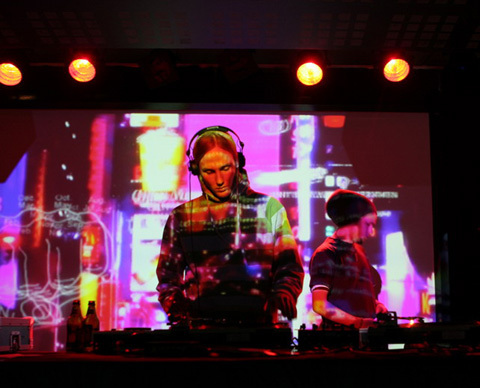 - Gabor Kitzinger from Hungary will present Cinetrip, an organization which has organized several large scale events and VJ competitions, set up an own VJ-TV broadcast through the Filmmuzeum channel dedicated to VJ practices and published DVDs of the Hungarian VJ scene. - Jaagup Jalakas, Taavet Jansen and Propaganda VJ collective from Estonia will introduce together the VJ activities of the electronic music festival Plektrum and the VJ forum www.vjestonia.com. * The seminar will also be dedicated in part to the presentation and discussion of networking tools that allow people to communicate and share information over the web. The project of a new Finnish VJ network forum will be used as a case-example. This forum is intended to work on a local level and aims to connect to other similar sites throughout the Nordic countries in the future. It will be hosted by the media arts collective Katastro.fi. The creators of the project will discuss the perspectives opened up by such a tool.